I J Fitness is a space efficient deluxe power station for doing vertical knee raises- VKR, push ups, pull ups, chin ups, dips, abdominal exercise and more- so you’ll get to do a great variety of exercises using your body weight- body resistance on a single equipment that offers several workout stations. It has wrist, elbow and forearm support that are 1.5 inch thick and cushioned back support for helping stabilise the movement so your body will not shake. 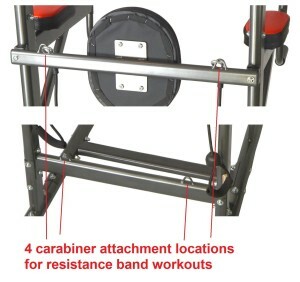 The maximum amount of weight it can carry is 250 pounds, the distance between the grip handle and elbow placement is 15 inches and it is 23 inch wide on the VKR- vertical knee raise station which is good for working your upper and lower core or abs and quad muscles. You’ll find five adjustable levels from 75 to 91 inches and you can work your biceps, lats, upper back, shoulders, deltoid, pecs, obliques and upper forearm on the Chin Up/Pull Up station. Dip station is 23 inch wide and 41 inch tall and you can work your back, pecs, deltoid and mainly triceps. Push Up station is good for shoulders, arms and chest with its 24 inch spread foam grip handles. Then you have two elastic resistance bands to add more to your workout routine. You may put it up against a wall as all the exercises are on the same side of the unit, so you can save on space in your house and you will be targeting several muscle groups and have a very efficient workout to help you build a lean muscle mass by increasing metabolism and burning calories and fat. This is a well built and sturdy deluxe tower station with almost zero shaking or wobbling but this will also depend on your weight, max capacity is 250 lbs and you probably don’t want to push it too hard and if you are not too hard on it as this is more of a budget priced unit with good set of features, it does what it is supposed to do very well and will last you a while. You may need to do some assembly work but is simple enough to assemble and you will get the proper instructions and we don’t have detailed information but the warranty is reported to be 1 year by the manufacturer and although there aren’t many product reviews out yet, this one is currently one of the better selling tower stations on Amazon.com.